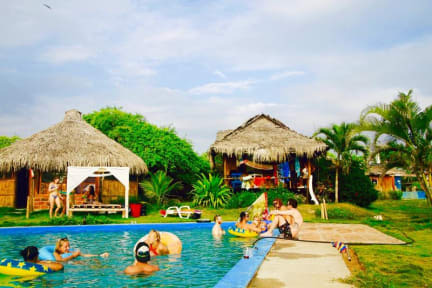 Kamala Surf & Backpacker Hostel i Montanita, Ecuador : Boka nu! I stayed at Kamala for 10 days and it was hard to leave. Staff is super friendly, the common area is just great to hang out at and meet other travellers. You can have a drink together, pre- & afterparty or just have a chilled movie night. It quickly feels like becoming a family. The food is very good and they cook for you everyday. Dinner nor breakfast is included though. The pictures do not lie as it actually IS as nice as it looks, when not even better :) definitely recommendable! Had a great time. Great parties in the evenings. Food was the best I had in months. Just expect to spend $15 per day on food if you're not into long daily walks. Due to low season there was no sun and was quite empty during the week. Really enjoyed my stay at Kamala. Relaxing and a very good atmosphere! Staff were all super nice and food was great, the communal dinner definitely fills you up! Beds come with mosquito net and are quite comfy, although the rooms can get a bit hot with just one small fan to cool down. The pool is really big but unfortunately not the cleanest as there's a lot of bugs etc in it. It's a bit of a walk to town but for me it was only a plus to get away from the noise downtown. Would stay again! If you're not into partying every night then maybe u should look elsewhere.. We stayed 4 nights and every night we fell asleep to loud music and every morning when we woke up people went to bed. This was like 8 o'clock.. and people took shots like 10 in the morning aswell.. But the facilities was nice (ok maybe not the bed, very thin matress) and just by the beach. They had a adorable donkey that roamed the hostel! So friendly and playful. In the three that I have been traveling, I have never stayed in a place like this. I'm really just trying to be honest with all of you. The hostel location is nice and montanita is lovely but the actual hostel was terrible. I didn't have a net for my bed and I got bitten alive by mosquitoes. Also, there was no hot water or water really at all.